Svenska Tanso AB participate as an exhibitor at the Alihankinta in Tampere Sep. 25 – 27 2018. We are open as usual between Christmas and New Year, though with somewhat reduced staff in our production. We are now looking back at a hectic and also very successful year. We would like to express our sincere gratitude to all of our customers, suppliers and other partners for shown confidence and co-operation during the past year. 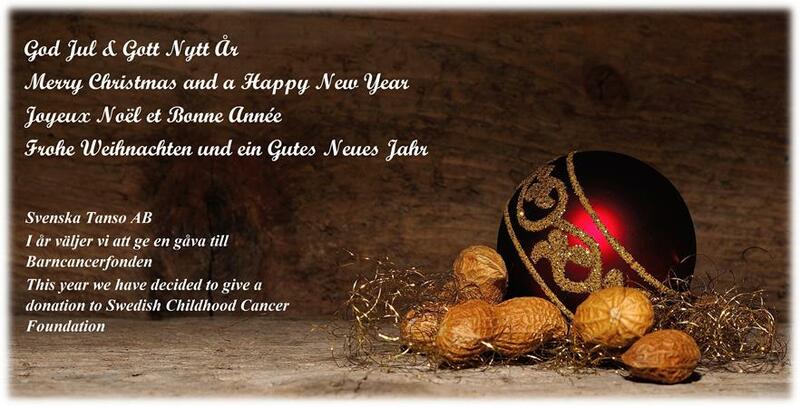 This year we have decided to give a donation to Swedish Childhood Cancer Foundation. The technical problems has now been resolved so you should now be able to reach us by phone again. We are currently having technical problems with our phone system. We apologize for any problems that may arise. More information is available by following below link. This filter series is manufactured by using a new synthetic high density polyester filter media, a filter media with unsurpassed strength when wetted. The thin filter media (0.08 mm) makes it possible to vastly increase the filter surface area and therefore also greatly extend the intervals between necessary replacements of used filters. For more detailed information on our IQ PREMIμM range of filters, please click on below link. We would like to welcome Oskar Hellsing to our team here at Svenska Tanso AB. Oskar will work as a sales engineer for our composite materials were we due to high demand of our quality products needs to strengthen our customer support and our presence on site at our customers. Oskar is newly graduated as a composite technician from the University in Varberg. He will mainly work from our headquarter in Jönköping.